Warren W. Klumb, 82, formerly of 512 W. Michigan St., Port Washington died Sunday, April 30, 2006 at Heritage Nursing and Rehabilitation Center, Port Washington where he had been a resident since August, 2004. 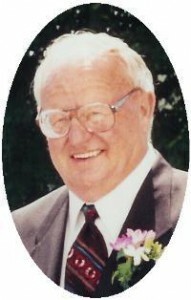 He was born December 24, 1923 in Fredonia, WI to Walter and Anna Peterson Klumb. He married Margaret M. Jentges of Port Washington on February 9, 1943 at St. Mary’s Church in Port Washington. He earned an Accounting degree from the Milwaukee Business Institute and began working as the office clerk/bookkeeper and machinist for the former KwikMix in Port Washington for 51/2 years. He then began working at Simplicity Mfg. Co. in Port Washington as a machinist. He retired after 36 years in 1989. He also worked part-time at the former Jacque’s Crane and Welding in Port Washington. He was a 50 year member and former financial secretary for the International Association of Machinist and Aerospace Workers, Local 1430. He was a family man who enjoyed helping and working with his children, loved to play cards with his wife and friends and was voracious with crossword puzzles. His wife preceded him in death October 21, 2001. Warren is survived by his children Shirley (Bruce) Kozelou of Lyons, WI, Edward (Betty) Klumb of Port Washington, Alice (Donald) Brock of Saukville, Steven (Judy) Klumb of Port Washington, Daniel (Lorie) Klumb of Oostburg and Donald (Kate) Klumb of Leawood, KS. Further survived by sister Lucile (Norman) Neitzke of Menomonee Falls, WI, 13 grandchildren, 5 great-grandchildren, nieces, nephews, other relatives and friends. Funeral service 6:30PM Thursday, May 4 from the Poole Funeral Home, 203 N Wisconsin St., Port Washington to St. Mary’s Church, Port Washington for Mass at 7PM. Interment parish cemetery. Visitation 4 – 6:30PM Thursday at the funeral home with a 4 pm rosary service. Memorials to St. Mary’s Church Endowment Fund appreciated.